Cold Stone Creamery gets into the spring spirit with the addition of two new flavors: Wild Blueberry Muffin Batter Ice Cream and non-dairy Whipped Meyer Lemon. Whipped Meyer Lemon is featured in both a Creation and a frozen beverage. The Golden Oreo Lemon Whip sees the non-dairy frozen dessert folded with strawberries, Golden Oreo cookies, and whipped topping. 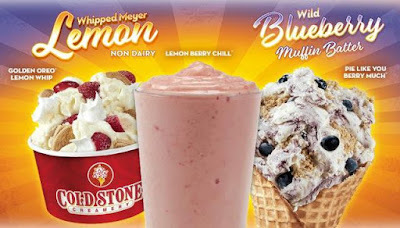 The Lemon Berry Chill is a frozen beverage of Whipped Meyer Lemon blended with strawberries. Wild Blueberry Muffin Batter Ice Cream and Whipped Meyer Lemon are available for a limited time trough May 14, 2019.